Posted Breed: Dalmatian / Pointer / Mixed (short coat). 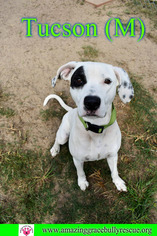 Tucson is a handsome, friendly one year old male Dalmatian/Pointer who came from a nearby shelter in Southern Alabama. He is very smart and obedient and already knows some basic commands. Tuscon has a healthy short coat and is mostly white with some black spots on him which remind us of Petey from the Little Rascals. He is crate trained and loves to ride in cars. Tucson is currently in an Amazing Foster home and his new BFF is a handsome Lab who knows lots of cool tricks! Tucson will make a wonderful addition to any family since he loves adults, kids, and other dogs. His Foster Family says that he is very sweet, eager for love and attention, and super smart and motivated by food. He needs daily exercise and a yard to play in or else he will sing for you a very insistent song. He would do best in a home with a forgiving dog that does not mind having his toys or treats rudely absconded with by this big, goofy puppy. Amazing Grace Bully Rescue is a foster based rescue in the Pensacola, Florida area. We do not have a physical building. If you would like to meet any of our pups, the first step is to fill out our online application so we can contact you. Our adoption fee for Tucson is $150 and includes his neuter, current shots, and microchip. If you would like to adopt this Amazing dog, please fill out our online adoption application at .amazinggracebullyrescue If you have any questions or would like more information, please text or leave a voicemail at 850-723-2037. Posted Breed: Dalmatian / Pointer / Mixed (medium coat). Luna Smiles at you! Ask for her video! Posted Breed: Pointer / Dalmatian / Mixed (short coat). Adoption Fee: $125. 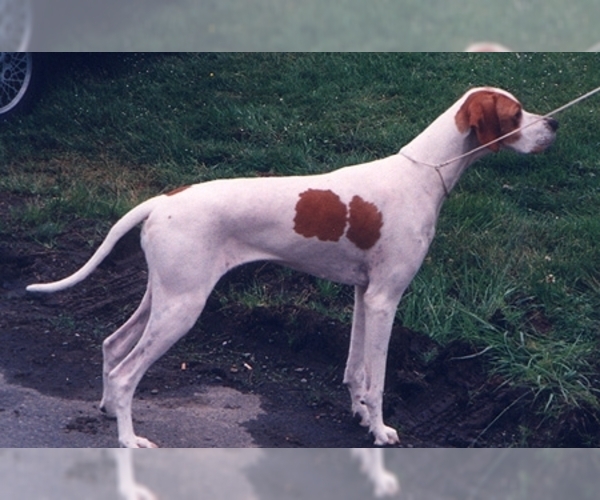 Posted Breed: Pointer / Dalmatian / Mixed (short coat).